Jennifer Aniston Jealous of Angelina Jolie and Brad Pitt’s New Movie – Wants One With Justin Theorux? Angelina Jolie and Brad Pitt are reportedly planning to do a movie together, for the first time since Mr. and Mrs. Smith. Considering the fact that it was that movie that launched their relationship, there’s understandably a lot of buzz surrounding this new project. Although we don’t have many details on the story, Jolie reportedly wrote it, which means it’ll probably be a war-time romance or drama – and at the rate she’s going, it’ll end up getting Oscar buzz before its even filmed. 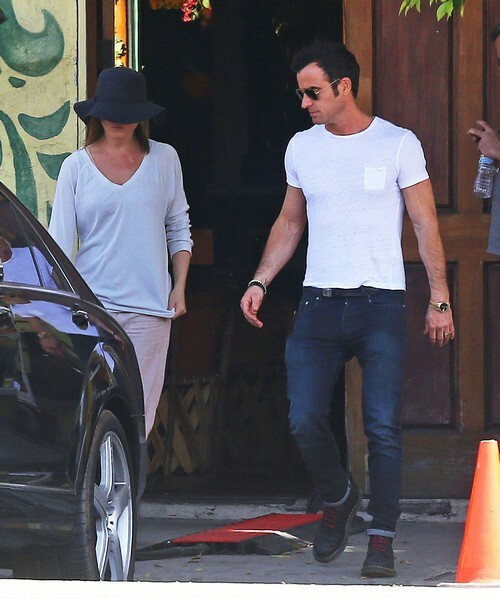 Now, don’t be surprised if Jennifer Aniston also announces that she’ll be working on a project with Justin Theroux. Except in this scenario, Justin would have to write the project – and it shouldn’t be hard for him, since he’s actually a professional screenwriter. Isn’t that funny? Justin is the Angelina of their relationship. Anyway, we’ve already covered how Jennifer is jealous of Angelina’s career success, and how she wishes that she had diversified her roles before she got pigeonholed into comedies forever. She still has the ability to command a large salary, and she’s indisputably a major celebrity, but can she greenlight a major film just on her involvement? Can she write or direct an Oscar-winning project? Can she garner the media to buzz about a project if she and Justin were involved in it? Well, I guess we may find out, if the rumors are true. If Jennifer is truly trying to work on a project with Justin – and it makes sense, she’s an actress, he’s an actor and a writer – then we’ll probably hear about it sooner rather than later. However, he’s pretty busy with his TV show at the moment and she still has to finish filming the Oscar-baity Cake, so they’re probably still working on the idea. What do you guys think about Justin and Jennifer collaborating on a project? Will it end up being yet another stupid bust like Wanderlust? Will Jennifer plan to release it at the same time as Brangelina’s untitled film? Let us know your thoughts in the comments below.